This week, I attended three plays in Galway, three nights in a row. The marathon of shows was part of the Galway International Arts Festival. I do not attend plays regularly, and seeing three in a row was a unique experience for me. I barely had a moment to process the last show before sitting down for the next one, until today when I paused to contemplate them separately. At the end of each performance, the venues sold copies of the scripts, and I decided they would make good souvenirs from a city embedded in art, music, and theater. The first show, at An Taibhdearc, was a trio of three short plays by Irish playwright Samuel Beckett. The plays were Not I, Footfalls, and Rockaby. They were performed in total darkness; even the exit lights were turned off. The first is a monologue spoken so quick that much of it is lost. The only light is shown on the actress’s mouth, so that all the audience can see is a disembodied mouth babbling intensely. The second portrays a daughter pacing as her mother passes away. They speak to one another as the actress (providing the voice for both characters) walks slowly like a clock, from left to right. The last, and perhaps most disturbing, shows an elderly woman in a rocking chair. She is motionless; the chair is not. The chair rocks her face into and out of a pale beam of light as she reflects morosely on her last days and lonely life. Each play is darker than the last, more disturbing, unsettling, and saddening. Evidently, Samuel Beckett does with plays what Stephen King does with novels. The second was a new play by Christian O’Reilly, entitled Chapatti, at Town Hall Theater. Costarring American actor John Mahoney, it was a cheerful romantic comedy about a dog-owner and a cat-owner. For all its cute jokes and warm humor, it touches on several serious issues: terminal illness, dissatisfaction in marriage, suicide, and the poor way men treat women. The author places two lonely, elderly characters close together and draws them closer, but each time the plot delves into the complexities of the characters’ pasts, the plot veers in another, more lighthearted direction. There are many instances when the author brushes aside these disconcerting issues, but the humor is well-written, and thoroughly enjoyable, especially after three live nightmares courtesy of Samuel Beckett. The third play was another new show, Be Infants in Evil by Brian Martin, performed at the Mick Lally Theater, or Druid Theater. This play remains my favorite of the three. The audience walks into a room filled with incense and a Catholic Priest kneels and prays on stage. The author focuses on what first seems like too many issues to balance in a one-act play. The priest hides numerous secrets, a young woman and long-time friend has converted to Islam to marry a wealthy man, an elderly blind woman is beginning to catch on to the priest’s secrets, and a thirteen-year-old boy from the priest’s past has just shown up. The play juggles science and religion, child abuse scandals, abortion, forgiveness, guilt, and revelation, and ties them together by slowly binding the characters into concentric rings of conflict and secrecy. There is humor where there shouldn’t be, and love for characters who should not be loved. I have often thought that the two primary centers of culture in the U.S. are Hollywood and Broadway, and while I love films, I find myself daydreaming about attending a new play on Broadway, but I have never once dreamed of going to Hollywood. I regret that I do not go to plays more often, and that I do not participate in theater more. Flagstaff has what I believe to be a rich but precarious theatrical culture. When I return, I hope to participate in that culture. Theater is far more intimate than cinema. The silences are more unsettling, and the noise is more overwhelming. The audience becomes a part of the show, and there is always the possibility that the players will improvise, develop a set of inside jokes with the audience, and wait outside to meet the fans. These three plays were written, staged, and performed brilliantly. Each was different from the last, and it’s thrilling to see the house lights dim and see the first characters step on stage to deliver the opening lines. It’s a thrill I hope to feel more often. 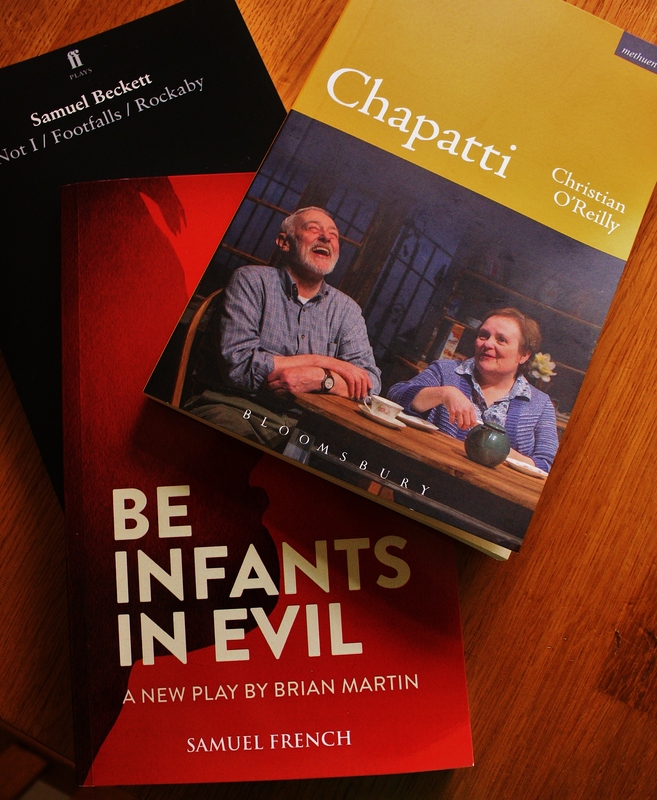 This entry was posted in Theater, Writing and tagged Audience, Be Infants in Evil, Brian Martin, Chapatti, Christian O'Reilly, Galway, plays, Samuel Beckett, Stage, theater on July 25, 2014 by keeneshort.